Give a creature Lethal this turn. Felldew is a rare Agility action card. It is part of the Isle of Madness story set. It acts as a double card in your deck with Elytra Noble. 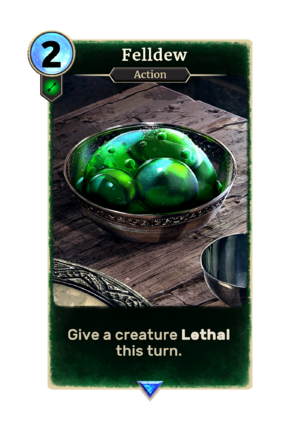 This card's ability applies the Felldew Euphoria card effect. Felldew previously appeared in the Shivering Isles expansion for Oblivion. This page was last modified on 7 April 2019, at 22:40.